Bogaurd is an energetic 9 month-old, male Doberman. He was struck by an automobile in December 2011. His owner's rushed him to Valley Emergency and Referral Center for triage. After relieving Bogaurd's pain, x-rays were taken of his right forelimb. Bogaurd had suffered a serious fracture of his upper right arm bone (humerus was fractued into 4 pieces) and needed surgery to repair the fracture and restore function to the limb. Bogaurd was then transferred to Ranson Animal Hospital for surgical evaluation. After review of VERC radiographs it was determined that Bogaurd's humerus would need to be repaired with an orthopedic plate and screws. Bogaurd's fractured leg was immobilized for the night and surgery was scheduled for the following day. Bogaurd underwent a 3-hour surgery during which a compression plate was utilized to secure his fracture. Bogaurd was hospitalized overnight to evaluate his pain level and to continue IV medications and fluids. Bogaurd was able to utilize his repaired leg the morning following surgery and was discharged to home care that day. He was placed on exercise restriction (no stairs, jumping, etc) for the next 6 weeks while his fractured leg healed. Four weeks after surgery, Bogaurd's right leg was radiographed again to evaluate the healing process. X-rays showed spectacular new bone growth all around the fracture site. At this point in his recovery, Bogaurd was placing his right forelimb at every step and was able to bear 90% of his weight on the leg. Six weeks after surgery he was able to bear 100% of his weight on the affected leg. Valley Emergency and Referral Center radiograph. 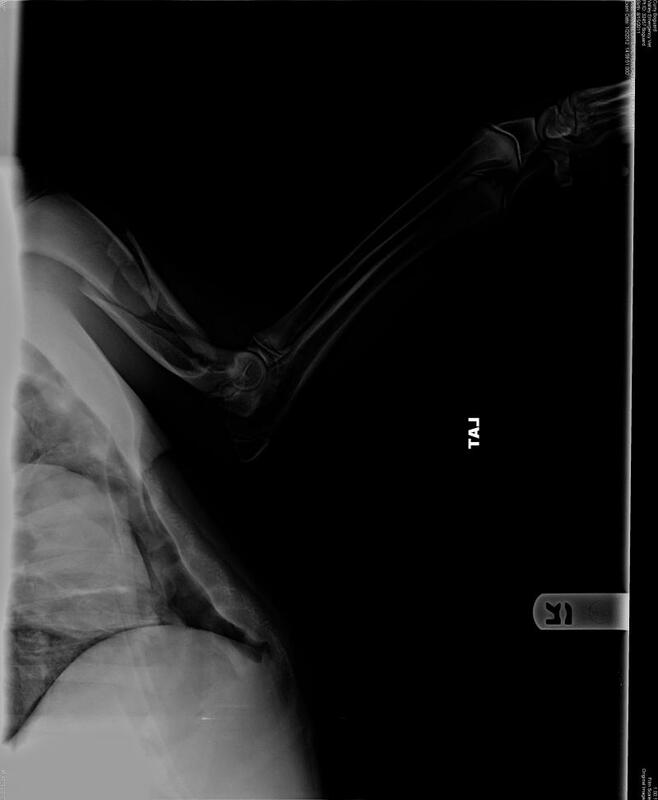 Fracture can be seen to the left of the elbow and extends almost to the right shoulder. 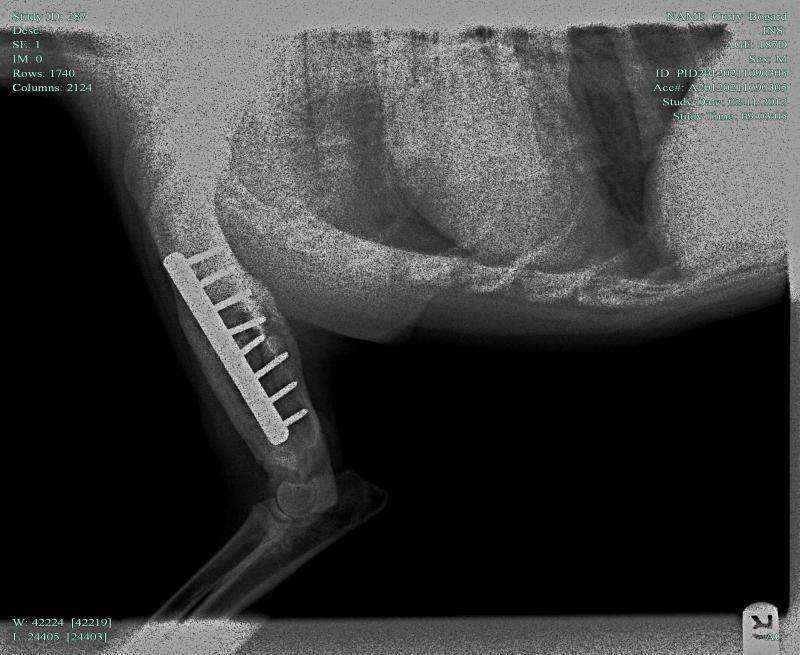 Ranson Animal Hospital post-operative radiograph of fracture repair. X-ray shows adequate reduction of the fracture after application of a heavy-duty compression plate and screws. 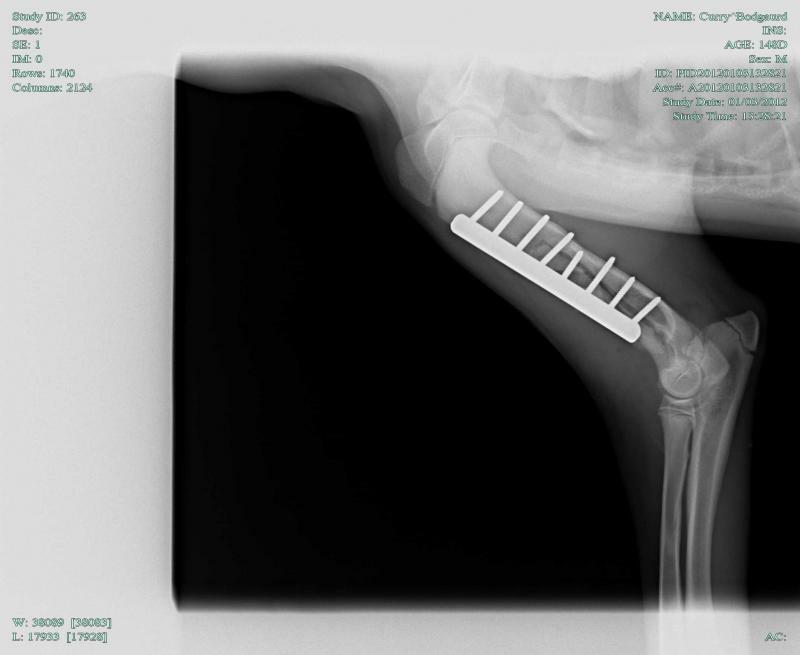 Ranson Animal Hospital 4-week post-operative radiograph of Bogaurd's repaired right humerus. Notice the new bone growth on all sides of the compression plate.